Bring 4 cups of water to a rapid boil. Add green beans and dragon or wax beans, stir for 30 seconds, and remove from heat. Immediately immerse beans in an ice bath or run under cold water until cool to stop the cooking process. 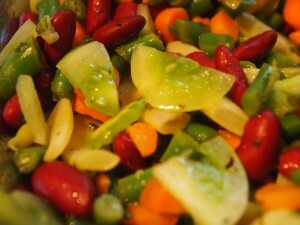 In a large bowl combine green tomatoes, blanched beans, and kidney beans. Set aside. In a small bowl or glass combine lemon juice and olive oil. Pour dressing over beans and add fresh basil. Stir until evenly combined and add salt and pepper.